PA envoy to the United Nations says PA seeks justice "for all the victims that have been killed by Israel". The Palestinian Authority’s (PA) envoy to the United Nations on Friday formally requested membership in the International Criminal Court (ICC), which would allow war crimes complaints to be filed against Israel, reports AFP. "This is a very significant step," envoy Riyad Mansour told reporters. "We are seeking justice for all the victims that have been killed by Israel, the occupying power." Secretary General Ban Ki-moon is to review the so-called instruments of accession and notify state members on the request within 60 days, the report noted. "We are honored that we are the 123rd state-party of the ICC, which will be effective in about 60 days from now in accordance with the rules and procedures of the ICC," Mansour said. The PA envoy submitted the so-called instruments of accession to the United Nations' top legal affairs official, Stephen Mathias, at UN headquarters in New York. PA Chairman Mahmoud Abbas signed requests to join the ICC and 16 other conventions on Wednesday, a day after the Security Council failed to adopt a resolution paving the way to full statehood. The United States has branded the move to seek ICC membership as "counterproductive" and warned it would only push the sides further apart. 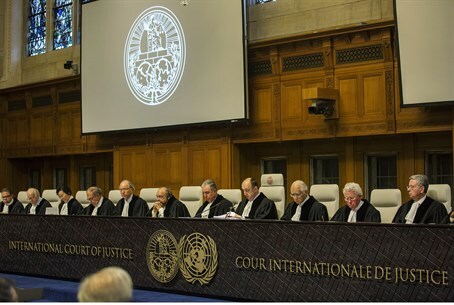 According to AFP, Mansour said the PA had also filed a request with the ICC in The Hague to grant retroactive jurisdiction to the court to cover alleged war crimes committed during last year's Gaza war. Mansour said the PA will also be seeking to launch legal action over Jewish settlement construction, which he said was a war crime under the Rome Statute. "This is a peaceful option, a civilized option and an option that anyone who upholds the law should not be afraid of," he said.